It is a great pleasure to recommend Muhammad Zaki Dzunurain for highers studies in Turkey by your scholarship as a Turkiye Scholarships holder. I know this intelligent boy for the past two years. I was his teacher in 3 Senior High School. I rarely come across students of this kind of level. He has memorized 30 Juz of Qur'an and explored its contents. To keep his memorization, he always read the Qur'an every morning and every night. He also see the meaning of the verses he read to know its meaning. 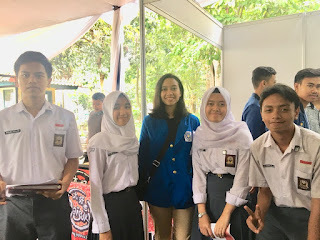 On 24th January 2019, SMAN 3 Bandung held an annual event called Edu Passion. Actually, I already posted about Edu Passion on my previous blog in 2018. This year's Edu Passion is themed Edu Passion 2019 : Agranasta. Edu Passion invited many public and private universities in Java. This event helped us to get more information about different universities and lectures abroad. There were many stands of local universities, abroad universities, some courses, and foods. This event wasn't only for SMAN 3 students, but external school also participated. Goals 9 "Industry, Innovation, and Infrastructures"
The reason why we choose this topic is because this will determine Indonesia's economic growth. Most population in Indonesia now living in cities. Mass transport and renewable energy are becoming ever more important, as are the growth of new industries and information and communication technologies. For example, facilities on the toll road is still inadequate and uneven. This will effect mobility of people outside Java. Another example is terrain in Indonesia is still rough. This will effect internet tower building, this means not every people can access the internet. Our solution to this matter is to improve human resources by increase education equality and allowing private company to help improve Indonesia's infrastructure like Public Private Partnership Program, applies to the communication, transportation, irrigation, electricity, and waste management sector.